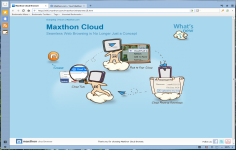 Maxthon Cloud Browser is a great alternative to Internet Explorer internet browser with many option for customizing. 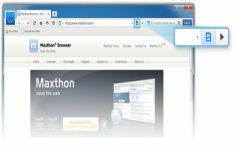 Maxthon Cloud Browser is a powerful cross-platform browser that works on both Windows and Mac, Android or iPhone. Maxthon uses only a small portion of system resources when surfing with a highly integrated user interface. It synchronizes data, browsing history and tabs with the device of your choice and allows you to create your own storage in the cloud. Being alternative to Internet Explorer, which used its rendering engine, but added many features such as tabbed browsing, a lot of plugins, the possibility of Skinner interface, customizable menu bar, parametrized around and more information. Being compatible with Windows 8, Maxthon Cloud Browser offers a highly customizable interface, quick start and smooth navigation experience. It offers the possibility to swap, add, move, remove, and change Maxthon's tool bars, icons, menus, colors, skins, and layouts.